Read Part 2 in the series, about my experience in Kenya, here. Sintayehu, center, an 18-year-old who has lived with the Selamta Family Project since she was 12, plays a game with her biological sister Senayet, left, and her Selamta brother Dagim, at their home in an Addis suburb. On the day I leave with She's the First to visit their partner in The Gambia, I'm finally blogging about the final leg of our trip last fall to East Africa! I promise to be better about blogging this trip more immediately! The final stop of my six week trip with She's the First last fall was to Addis Ababa, Ethiopia, to visit STF's partner, the Selamta Family Project. Selamta is a nonprofit organization that creates permanent family units for orphans in AIDS-ravaged communities. The organization finds children living on the streets, reunites them with biological siblings, and creates a new family unit around them, with a house mother, an "auntie," and up to 9 siblings. No one ages out of Selamta; the families built here are meant to continue to support one another, beyond graduation and throughout adulthood. The children all attend a local private school near the neighborhood where they all live. The Selamta family at Bishingiri house, one of eleven Selamta families. Each house is named for a significant person or place in Ethiopia. 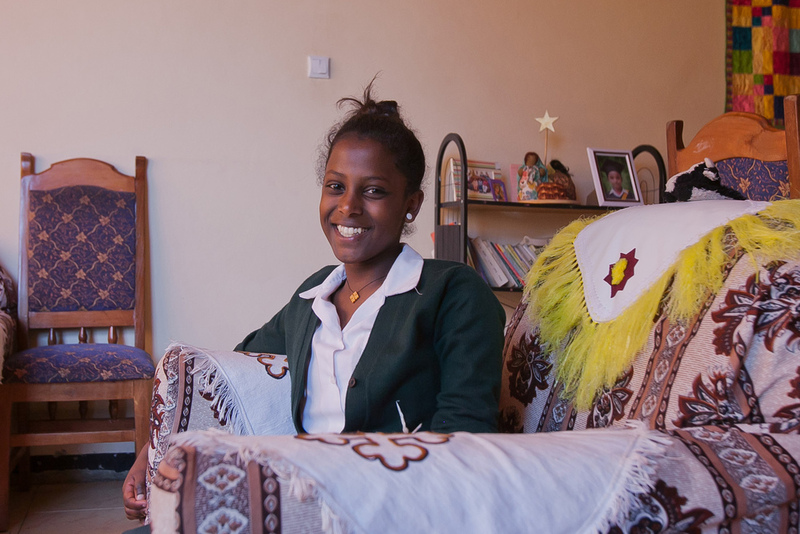 Tizita poses in her home at Gondar house. I had an amazing time getting to know the She's the First Scholars in Ethiopia. Tizita, above, is a delightfully sassy eighth grader who let us follow her around with a video camera at home and at school, and visited the National Museum with us in Addis (she'd never been either!) It's so much more fun to visit a museum with a student; she was interested in EVERYTHING and had learned about some of the exhibits in school! She's also the star of the independent film Difret, by an Ethiopian filmmaker, filmed in Addis. The movie was a screened at the Sundance Film Festival! I can't wait to check it out when it makes it to New York. She's the First Scholar Emuye, right, and her Selamta brother Abel. Emuye is sponsored through She's the First by Wild Sister Magazine, from whom I won a grant that helped fund my travel for this trip. Boys from the Gondar house play soccer in their courtyard. A horse and buggy travels through the suburban neighborhood where the families live near Addis. The house cat prowls while Ras Dashen's house mom makes afternoon coffee. Emuye grinds roasted coffee beans in the traditional fashion, with a mortar and pestle. Roasting coffee beans during the daily coffee ceremony. Dagim takes a picture as his biological mother and house mother prepares an afternoon snack for all of the kids. The house mothers come to Selamta with their own biological children, blending them into their new family. Tigist helps care for a neighbors' children after school. The Scholar that I spent the most time with was Sintayehu, an 18-year-old student who has lived with Selamta since she was 12. She took us back to where she was living before she came to Selamta; I did a photo essay about the experience for She's the First. After Sintayehu became part of a Selamta family with her younger brother, the organization sought out their younger sister, Senayet, and brought her to Selamta as well so the siblings could all grow up together. Mama Turuye, a friend of Sintayehu’s grandmother, walks with Sintayehu in the impoverished area where she was living before Selamta. Sintayehu, center, giggles with a friend during Physics class. Each child in the Selamta project is enrolled in a private school a short walk from the neighborhood where they live. Selamta provides a stable home environment and the support of a family and a mentorship organization, as well as quality education, to orphans who would otherwise be living on their own, often separated from their siblings. After visiting Selamta, I'm hopeful that similar family-oriented organizations will be formed in other developing areas. To see more of my work for She's the First in Ethiopia, visit their Flickr page.